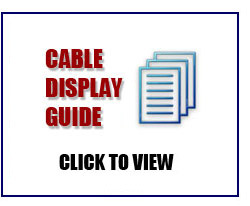 Replace existing cable display components or build your own wire display with our range of clamps and cable kits. Hard wearing, high quality cable display components include various size clamps for holding poster pockets and leaflet dispensers onto the cables. We also stock three different fixing type cable kits; floor to wall, wall to wall and floor to ceiling making us your one stop shop for cables and clamps.